When I was in Academic Decathlon, they asked me “What’s your favorite book genre?” My mouth went dry and I know I took too long to answer. “Fiction? …or nonfiction.” Any question connecting favorites to books strikes me as entirely unfair. After all, how many books are published per day? When I was a kid I wanted to read every book ever published. Even now, I occasionally get anxiety attacks over the sheer number of books I haven’t read yet, and all those brilliant works I may not ever read. By Roman times, scholars were bemoaning the breadth of important literature, and the impossibility of reading it all. There’s just no way to keep up—or in, e.g., in the loop. I’ve always had eclectic reading tastes: I’ll read science and history and paranormal romance and the so-called literary novel and fantasy and memoir. I’ve never been discriminatory and I love (some) genre works as much as I love (some) of the classics. Let’s face it, some of the classics are only canon because the manuscript happened to survive. Growing up with reading privilege, which is to say, a bookcase in every room, my own library before I could read on my own, I learned to love books, and especially value the physical book. Books are more than just a product, because all those words stand for ideas, a nearly direct communication from the author’s brain to yours. Fortunately, they do not include mind control, and so you are free to interpret the author as best (or worst) you can. As a dedicated reader of everything, I feel guilty for sidling along with the e-book bandwagon. (I’m far too timid to jump after all, and paying that much for those little text files?) People keep talking about e-books killing the traditional publishing market. Which I find problematic in two parts: first, with the rise of the dependence on technology, some form of change was inevitable, and second because that’s just such a huge shift for so little benefit. Remember when email was supposed to mean we wouldn’t use paper anymore? My nook is nice. I can carry around as many books as I want; I have instant, free access to most classics (public domain), and I can read it more easily all the time. Like walking, or eating, and even knitting although turning the pages can be difficult with my fingers tangled in yarn. I can just set it on my knee and go, whereas if I try the same thing with a paperback—whoops, lost my place. But O! do I miss the feel of paper and slick covers and especially typography. Not that physical books always pay the closest attention to the quality of the interior pages, but the nook can never match even an average layout…especially when the e-book designer formats the text incorrectly and it doesn’t respond to my spacing and text choices and their text choice is awful. I nearly went all caps there, the phenomenon annoys me so much, but I didn’t think that’d be fair to you, dear reader. The nook fits in my purse better than my former minimum of two novels and a hardcover, just in case. 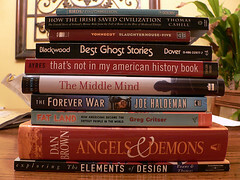 I have access to the library program books, which, though it isn’t a huge selection, is still different from the rest. I can only check out three e-books at once compared to the local library’s ten, but the two week limit means I don’t keep them three months before I get to read them—I mean I always try to finish, but you know, life gets in the way, and I couldn’t just not check them out, right? E-books don’t take up space on my shelves, which is good, because I don’t have any. And it’s easier to get new books on the nook, since I don’t live within 100 miles of a bookstore. But I can read a physical book better: because the pages are larger, you see two at once, and flipping black and forth is easier. 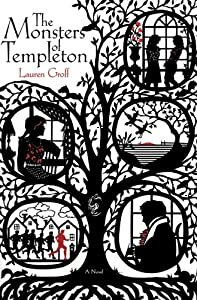 When I picked up The Monsters of Templeton this morning I realized I also read much faster and more happily. Dear everyone, don’t give up on the paper book because some people buy e-books. Physical books are accessible and shareable and so much more valuable. *I can’t find a standardized spelling for e-book anywhere.